With a wide-ranging, four-hour canvas to work on, Spike Lee’s When the Levees Broke: A Requiem in Four Acts, has plenty of time to paint a complex portrait of the unfortunate combinations of events that led to our country’s greatest national disaster, Hurrircane Katrina. Lee begins, appropriately enough, by stressing the inexact nature of nature. He tracks the progress of the storm and the thought process of the New Orleans citizens who rationalized their decisions to stay in the city despite a mandatory order to evacuate. For most of the first hour of this mammoth movie, the drama of the storm itself is focused on. Lee captures the horror that accompanied the realization that the levees protecting the city had broken and details the deteriorating conditions inside the Superdome, which served as a makeshift shelter. At the end of the first Act, however, George W. Bush is first shown, and director begins to examine how a natural disaster turned into a catastrophe of decentralized authority and poor decision-making. Throughout his first two Acts, Lee captures the unfocused rage and confusion that resulted from the general lack of communication and the slow Federal response to the disaster. There are times when the effort to turn every single aspect of the events into a travesty with villains behind them seems excessive, as typified by musician Terrence Blanchard’s vague suggestion that “somebody needs to go to jail,” but Lee doesn’t seem to have any specific target in mind himself. Though hindsight is obviously 20/20, Lee includes testimonials that lay blame at nearly everyone who should have been responsible for New Orleans citizens (perhaps rightfully so). Even though he’s not seen or heard from during the film, Lee’s own unfocused rage clearly shines through. That being said, there are sound bites that are included here that would have been best left on the cutting room floor. For example, when Michael Eric Dyson, an African American college professor and author, stupidly compares the disorganized evacuation efforts to the slave trade (! ), Lee greatly cripples the perfectly tenable argument that racial bias was responsible for the extended suffering of those who chose to remain in New Orleans. Giving a voice to so many disenfranchised people is admirable, and there seems something vaguely immoral about suggesting that Lee cut some of their comments out to better his film. Still, the counter-argument that his imperative as an artist, which is to produce the most effective work possible, should come first is more persuasive. By the end of the third hour, the platitudes that people utter to try to put into context the destruction and their sense of rage begin to blur together. Scenes like Blanchard’s tearful return to the city with his mother after the fact feels almost insignificant given the larger context. Blanchard’s presence is not all in vain, however. The New Orleans native’s score, despite so often being a detriment in Lee’s other films, is perhaps the director’s greatest asset here. 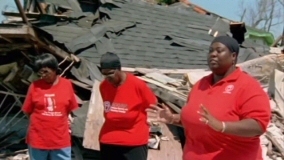 Blanchard’s magisterial soundtrack justifies the use of the work requiem in the film’s title and truly seems to articulate the widespread, confused anguish that the storm caused. Levees’ second half, which focuses on the aftermath of the storm, is more relevant than what came before. 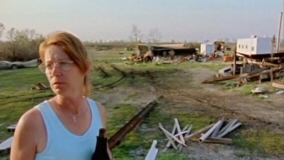 The stirring montage at the start of Act III says as much as any trio of interviews that Lee included to that point, and the most compelling segment of the film, which quickly follows, shows the disillusionment that New Orleans residents and displaced ex-residents now feel toward their hometown. This sequence powerfully demonstrates the negative impact on the city’s community, and sets up an indictment of the sorry progress that the city is making on its road to recovery. Perhaps best encapsulated by graffiti that reads “Hope is not a plan,” the second half of Levees is a call to arms. As Lee begins to examine the desolate New Orleans public school system, compares Louisiana to a colonial territory, exploited by corporate interests in richer states, and focuses on the questionable reconstruction of the levees, he productively stops placing blame about the past and suggests areas that demand attention here and now.